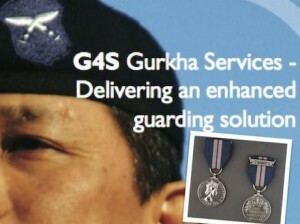 Four former British Army Gurkhas employed by G4S have received the Queen’s Gallantry Medal (QGM) for exemplary acts of bravery. G4S soldiers-for-hire Deepak Kumar Thapa, Janga Bahadur Gurung, Jeetman Sharu Magar and Shayam Kumar Limbu received the honour for resisting an attack on the British Council compound in the Afghan capital, Kabul, in August 2011, according to the Civilian Gallantry List published on 2 Sep 14. 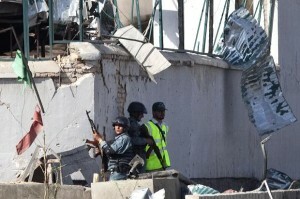 On 19 August 2011, the compound was guarded by eleven G4S operatives including four armed Gurkha guards, six unarmed Afghan National security staff and one British national security manager/bodyguard, according to the citation. Three of the Afghan security guards were killed by small arms fire, three others were wounded by blast and small arms fire but survived, and three of the four Gurkha guards were wounded. Gurkha Janga Gurung “engaged the insurgents . . . firing all his ammunition during a furious fire fight”. During the attack he fired some 8,000 rounds of machine gun ammunition. “By his actions Janga Gurung helped suppress the insurgents and bought critical time that enabled staff to enter the safe house.” Despite receiving a gunshot wound to the head, Shayam Limbu “stayed in the guardhouse area and protected the wounded Afghan National staff until he was rescued”.